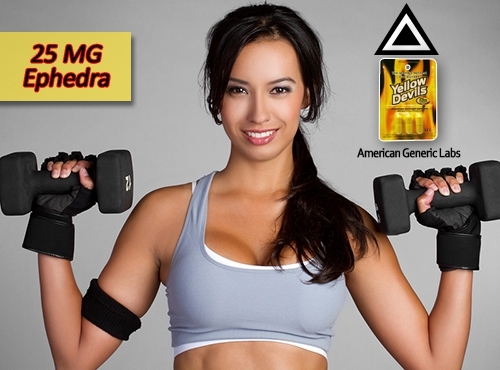 American Generic Labs yellow devils ephedra diet pills, “The World’s Hottest Fat Burner”. Will energize and supercharge your weight loss plan. With 300mg of Caffeine and 25mg of Ephedra Extract, Yellow Devils is a powerful thermogenic formula like no other. The skillfully blended ingredients will set your weight loss plan on fire! 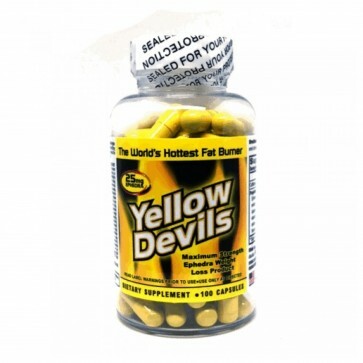 Yellow Devils “The World’s Hottest Fat Burner”. Will energize and supercharge your weight loss plan. 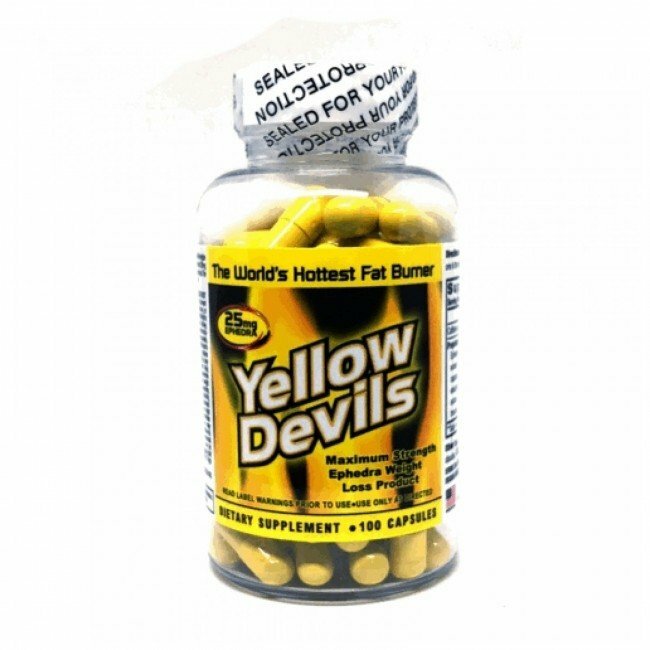 With 300mg of Caffeine and 25mg of Ephedra Extract, Yellow Devil diet pill s are powerful thermogenic formula like no other. The skillfully blended ingredients will set your weight loss plan on fire! American Generic Labs has created Yellow Devils for those of you who are serious about getting into shape. If you’ve been dieting and exercising and studying nutritional supplements, chances are you already understand some of the benefits provided by ephedra extracts. You also likely know about how often caffeine is used to boost energy during intense dieting. But did you know that the unique combination of ephedra extracts, caffeine, and other natural ingredients found in Yellow Devils produces a synergistic effect that can result in better, faster results than either ingredient alone? 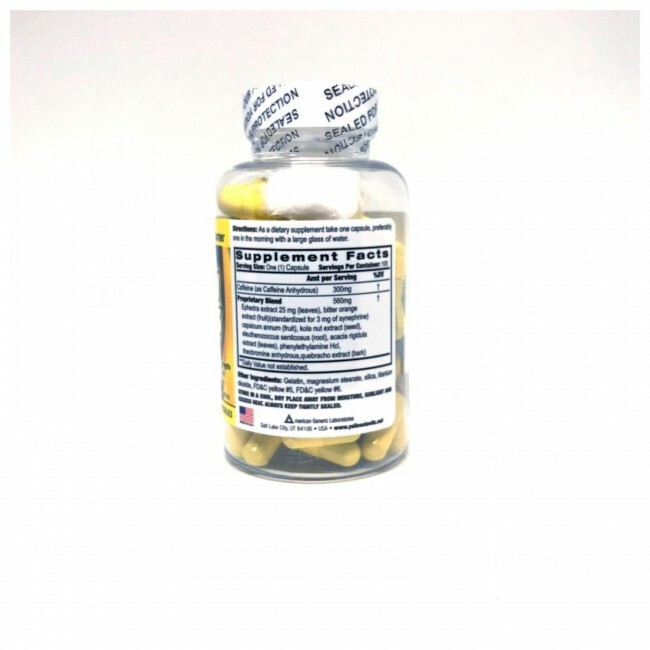 To maximize your fat-burning potential, Yellow Devils contain 25 mgs of ephedra extracts from the Ma-Huang province of China where herbalists and doctors have used the plant’s beneficial alkaloids for hundreds of years. Natural ephedra can help you achieve your ultimate fat-burning goals due to its thermogenic properties – that is, it helps you burn fat cells more efficiently at the same activity level. In other words, you lose more weight with the same exercise plan! Similarly, body-builders, personal trainers, and even office workers have long recognized the benefits of caffeine as a mild, natural stimulant that helps you maintain high energy levels, thus increasing your metabolism and helping you reach your weight-loss goals. However, Yellow Devils can help you take weight loss that one step further. For example, the studies suggest that the capsaicin in capiscum annum, also know as chili peppers, has been shown to help obese mice lose weight more quickly. Also, kola nut is widely used in some West African cultures to help increase energy and reduce hunger pangs. Other natural ingredients can help you develop increased endurance, faster weight loss, anti-oxidant effects, and maximum energy levels. What more could you ask from a weight-loss supplement? Specially designed for advanced nutritionists. Because of their high levels of natural extracts, you should only consider taking if you have fully researched the ingredients and understand the super results you’ll get with this amazing ephedra supplement. The secret to how Yellow Devils lead to such dramatic results is the way the ingredients work together. So, only order today if you are sure you can handle the ultimate effects that will take place with Yellow Devils natural ephedra and caffeine nutritional supplements. Directions: As a dietary supplement take one capsule, preferably one in the morning with a large glass of water. Staff Notes: Yellow devils with ephedra are often compared to Original Yellow Swarm and Original Yellow Sting. This product contains Cafeine.